I was a very fussy child. Maa can vouch for all the days of turmoil she went through where I was the resident terror throwing all kinds of food tantrums. Veggies were a strict no-no, save for potatoes. Fish was only restricted to Chingri (Prawns) and the occasional Ilish (Hilsa). My protein intake was never a problem though, 'coz I was a die hard carnivore since I can remember (Eggs strictly limited to omlettes). Maa therefore had a very tough time making me eat. To make matters worse, people who invited us to their homes always went 'tomar meye toh kicchhui khaye na' (translated: your daughter doesn't eat anything). Dad would describe this as 'playing carrom’, flicking the occasional Kumro (Pumpkin), Jhhingey (Ridge Gourd), Lau (Bottle Gourd) and the likes out of my plate. At times, I also resorted to stuff my pockets with things I didn’t find palatable. Maa of course didn’t find this very amusing. Bottom line was - I wasn’t the typical kid every parent would die to have. With passing time and peer influence (rather pressure), I began to explore my taste buds and discover food in all its glory. Fish and vegetables no longer made me squirm, though I maintained some very strict reservations and distance against few things (another day, another post). I gradually noticed people no longer giving me that strange look of disgust when they invited me to their homes. They now went, “O baba tomar meye toh onek khawa shikhey gecchey! !.” (Oh my goodness! Your daughter has finally learnt to eat). This feat was regarded something as close to having climbed Mount Everest. Yes, we Bongs are pretty touchy about our food in general. It’s amazing how realization always fails the punctuality test. It was at this phase of my life, where I was a good 1987 kms away from home, I realized what all I had missed. I started taking food much more seriously. So much that it gradually led something close to a passionate love affair, which l can shamelessly admit to. I saw myself spending more time fantasizing about food than Johnny Depp. Yes, that serious. I began exploring food not only on my plate but also in my kitchen. Results were varied – from good, bad to ugly. But I discovered my true love for cooking. It became my own little space where I could celebrate the highs and get over the lows, amost like an instant catharsis! With this blog, I intend to do all of that and much more. So, Lets Pakao! This is probably one of the easiest, simplest and fastest way of making Dum Aloo or Aloor Dom (Potatoes cooked/baked in a spicy masala). It is a tad spicy but you can adjust the heat according to taste. You can also throw in some green peas if you wish. Tip: You can make this masala and store it in an air tight container. Adds extra zest to your curries and chaats. Heat oil in a pan. When the oil heats up, add whole cumin seeds (jeera) and let them splutter for some seconds. Now add the boiled baby potatoes and fry them till they get a little browned on all sides. Now add the Magic Masala and some salt into the pan. 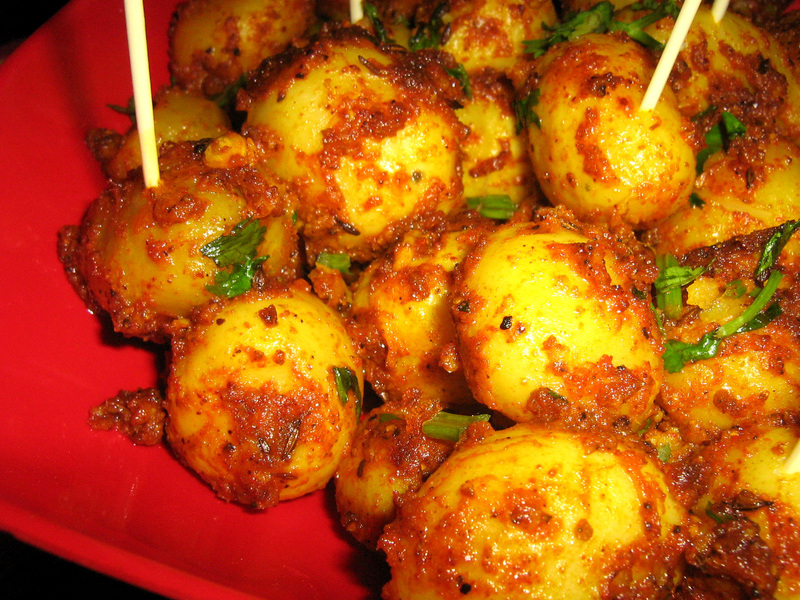 Stir the potatoes well till they get nicely coated with the masala. Now add in the sliced tomatoes and stir well to give everything a good mix. The tomatoes will gradually start letting out their juices adding a little bit of tanginess to the potatoes. Sprinkle in some water to avoid the masala from burning. This shouldn’t be too dry or too runny. Cover the pan for 2 to 3 minutes on a low flame. Add slit green chillies and some freshly chopped coriander leaves to finish. Serve this with luchi, puris or parathas. Or even as a vegetarian starter like I did.